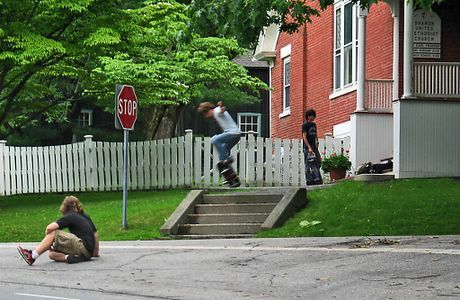 There isn't all that much to do in Sharon if you're a teenager - on your average summer evening, skating down the church steps is about your only option. Some towns in the area have put in skateboard parks, but Sharon doesn't have one. Is it just me who thinks skate boards are accidents waiting to happen?? Though they look like their having fun...oh well...maybe i'm just getting old!